I must commend out esteemed hosts for a fabulous event. All Frommagios should be so lucky. Now, I write now to commend the mature Tallegio form the cheese shop. Rarely have I had a stinky cheese offer so complex a flavor, even the paper was delicious. and when the the cheese book called it beefy, I mocked, but indeed, the mature Tallegio could stand up to a red wine, and it dominated the gentle pinot we had brought with us. 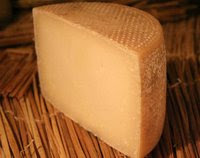 As for our other entrants, I also very much enjoyed the Piave Vecchio. though it was a hard cheese, it had overtones of fruitiness that I very much enjoyed. Interesting side discovery for me: bread makes an excellent palette cleanser, but was, if anything, a flavor deadener for the cheese. Anyone else think that cheese on bread should be left to the philistines? 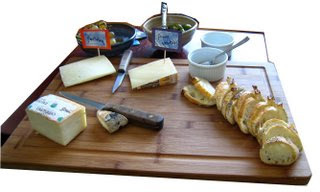 Indeed, pairings cheese with any sort of bread, especially fluffy bread, often takes the essence away from the cheese flavor(s). I often have a bland cracker or two with my fromages - this is so that there is some sort of 'palate stabilizer' in the mix without there being a more complete, carbo-thick flavor-reducer like bread. Kudos to Chedda and constituents for a West coast FDM event of excellence. I now have an additional cheese to try. While I have had the Piave and Taleggio (The ''Ledge' is one of my very favorites, actually, because of its not-so-stinky stinkiness and mouth smoothness), I have never tried the fruity and herbaceous Pantaleo. Thank you. As readers will know, Tallegio is one of those cheeses that is found regularly at Whole Foods Market and other large-scale groceries and, from my experience, the quality of their imports is usually pretty good. As for cheese identity theft, it is really no small thing. The internationally unregulated category of 'Swiss' cheese, for example, has lead to a democratization of and (I fear) decrease in the quality of what was proably originally intended to be Emmenthaler cheese. c. munster, you pose a very intriguing question, indeed. while bread+cheese is an obvious choice for a picnic in the park (and it's hard to deny the gustatory bliss contained in the baguette+butter+gruyere sandwich), i definitely agree that there's a certain flavor deadening that occurs when a fromage is sampled with bread. i like ricky's idea of utilizing a cracker, though i'm interested in whether a non-bland cracker would have the same effects as the bread. i plan on researching this today. as for the tasting: i believe i was the odd fromagier out in that i preferred the younger, less stinkified taledge. my cheese-tasting compatriots all seemed to prefer the stinkier, oozier, dare-i-say bougie-er taleggio. but i appreciated the supple, soft-yet-firm texture and the pleasant, simple, creamy taste of its competitor. the other tasters all said "boring", but i prefer "subtly refined". different strokes, perhaps. i also enjoyed the first two italian cheeses quite a lot. another interesting thing that we all noticed was that after we ate the stinkier taleggio, the flavors of the first two (much milder) cheeses really opened up. a truly fascinating phenomenon that i'm not quite sure i understand. ahhh, the wonder and mystery that is fromage. I think this tasting really brought Fromage du Mois back in style – Taleggio style. This cheese is the Cadillac of cheeses. Steve Jenkins writes: “Offering a wealth of slightly salty, nutty, meaty flavor, it beckons you to cut off just one more morsel. Moderation is particularly challenging for me when a Taleggio is sitting in front of me.” Steve, I hear you. I found the aged version particularly enticing – rich, complex, slightly stinky but in an alluring way. The difference between the aged and nubile renditions was striking. It was almost like eating a completely different cheese. The younger version was good, but I really think the “cougar” is worth the wait. In a sense the Taleggio really took control of the tasting. As others have noted, after eating the Taleggio everything tasted different. Never before have I had a cheese decimated the flavor of wine so much – in fact I thought it was supposed to be the other way around. The other cheeses were excellent as well. We must remember not reject subtle flavors in the presence of cheese giants. I thought the Piave Vecchio was the better of the two. Well complemented by sweets and the IPA it really changed in flavor, becoming much sharper, after trying the “ledge”. This would be good on its own as an addition to a salad or pasta.